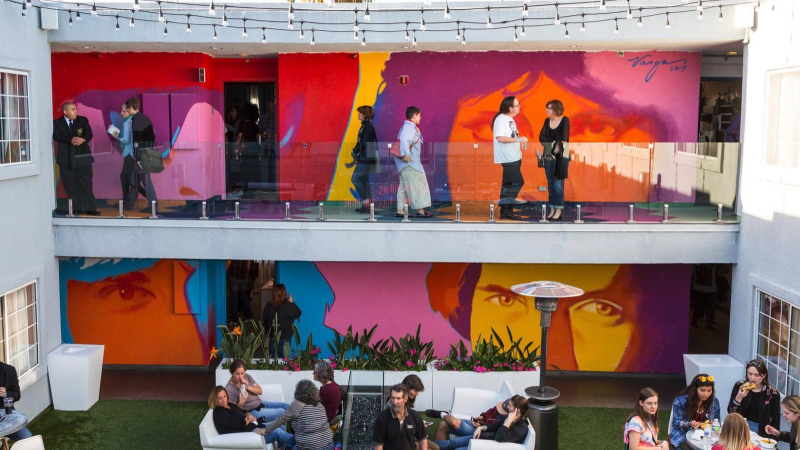 stARTup Art Fair comes to Kinney Venice Beach hotel February 15 – 17 for an art exhibition that bypasses the traditional gallery system by connecting hungry art buyers to highly curated up-and-coming artists. Check out over 60 artists, their work selected by art world experts. Hotel rooms will be transformed into individual exhibition spaces where their works are offered for sale. See the full list of artists here. In addition to art, there will be music, performances, food and drink by Berg Catering and Cameron Hughes wines. Tickets are available for purchase now. General Admission tickets are $15 in advance, or $20 at the door. Students/Seniors tickets are $10 in advance, or $15 at the door. A Three Day Pass is $30 in advance, or $40 at the door. VIP tickets are $100, and include admission to all three days of the fair, an invitation to the “First Look” preview Friday from noon – 2 p.m., all access to the Cameron Hughes VIP lounge and bar, and exclusive pre-fair collector’s tour. Check for discounted tickets before making your purchase via Goldstar where we spotted 50% off on daily tickets. The Opening Night Celebration is on Friday February 15 from 7 – 10 p.m. Fair hours are Friday February 15 from 2 – 10 p.m., Saturday February 16 from noon – 9 p.m., and Sunday February 17 from noon – 7 p.m.